If you have never heard of the KISS principle, let me be the first to share it with you. It has applications for most of life, and especially for business. 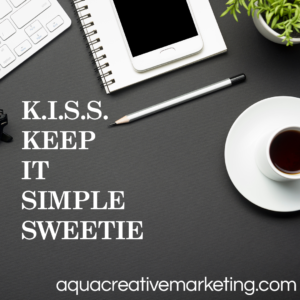 If you are familiar with it, I will share with you how Aqua Creative Marketing utilizes KISS for site design to optimize traffic, effectiveness and keep costs to you down. KISS, or Keep It Simple Stupid, is what it says, a reminder to us to keep things uncomplicated. However, since no one wants to be called stupid, let’s change it to “Keep It Solely Simple”. Either way, the point is that overdoing things is not the key to success. Just because you can do something, does not mean that you should. This applies to all areas of your business, especially designing your site. Why? Because when we are unsure, or even just excited, people tend to lose sight of practicality and what really works, and go for over the top theatrics. At Aqua Creative Marketing, we know that you want a site that expresses the individuality of your business, and will draw customers in. We also know that you could use the rainbow gradient and comic sans, which would certainly express your individuality. However, it will not accomplish the second, and greater goal of drawing folks in. When people are deciding who to give their hard earned dollars to, research shows that they go with businesses that give them a feeling of trust. And what do we trust here in the good old US of A? Tradition, structure, solidity. We have decades of experience in knowing what people want, and turning that into a website that you can be proud of that really works for your company. Utilizing principles of keeping it simple, we focus on your target market, your competition, and your goals. We collaborate quickly and efficiently to design a site that works well and looks fabulous. This keeps your costs down, because we stick to our guns about keeping it simple. Simplicity streamlines the entire process. Call us today for your KISS consultation, and stay away from the comic sans. Really.